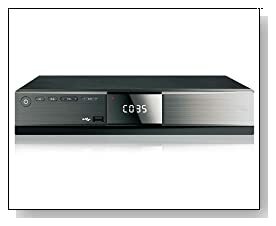 Latest digital converter box Viewtv VT-163 is for the one who doesn’t compromise on quality and look. The ATSC digital TV converter looks really cool and works perfectly. Price of this product is slightly high ($10-$15) compared to few cheaper products available in market but the stylish trendy design and reliable product quality makes it worth for the money. This device has very good digital signal reception and gives amazing audio and video quality. This device did extremely well in pulling the ATSC digital signals, even very weak channels were captured and played with very good video and audio quality. The main feature other than great audio and video quality is its digital video recording option. 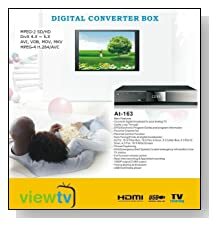 The device supports 1080P HD output with HDMI output port, which can be plugged in to any display device like digital TV, projector and computer monitor etc. If the display unit doesn’t support HDMI connection the converter box has coaxial, RF and YPbPr connections to make use of. The device has a USB port on the front side for easy access, just plug in a flash drive or external hard disc and record the live programs to watch them later. This feature is really good to have when you love to watch interesting games or shows again with your family or friends. Keep in mind the device supports recording option for only channel which is being played, it’s not possible to record multiple channels at a time. This trendy box can be used also as a media player. Same USB port can be used to play media files stored in flash drive or external hard drive. The box reads all common audio and video file formats easily and clearly. No need to say, the programs recorded by the device can be replayed with same box. It played few HD quality videos very well. Overall this digital converter box is very cool looking and best performing. This converter box is very easy to setup and start using. This device will serve its purpose well and also has some great features like video recording and media playing. Price of this device is slightly high but the quality of the product and performance makes it worth for what you pay.